We think, feel, interpret, process and communicate in all disciplines, using all our senses. Everything is connected. • musicianship for performers; and various other courses. 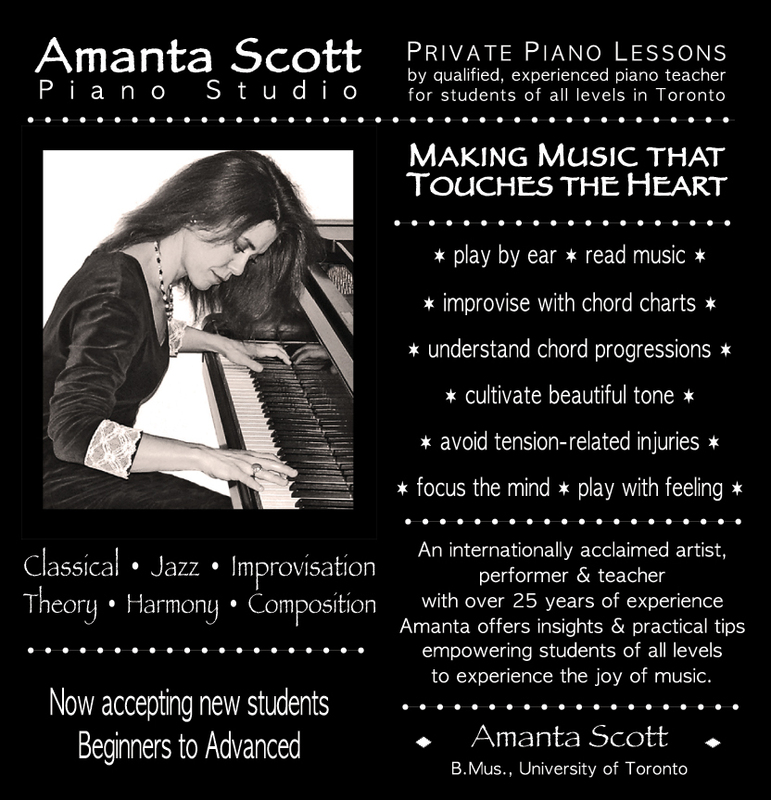 I offer private lessons and workshops for all ages — in public and private junior and high schools, arts academies and colleges. I also offer individual sessions specifically targeted towards entrance auditions to arts academies and examinations. For more information scroll down past the Hands Together Discussion Forum and/or feel free to contact me directly. I have a very effective success-based teaching method which I find very exciting, centred around conscious learning. — meaning that we discover how to learn from observing ourselves and examining our strengths in all areas of our lives, both at and away from the instrument. Every lesson I ask my students — "What did you discover this week?" and all of them have something interesting to share. For this reason I've decided to start a discussion forum here to encourage exchange between students of all levels and all disciplines. Sharing my love of music through piano lessons in all styles of music, I guide students of all ages to discover for themselves — the joy of making music. Understanding Theory and Harmony is like understanding the workings of the human body, the shape of the skeleton and the functions of the organs. Together we unlock the mystery of music . . . and examine how composers combine sounds and effects to generate deep feelings within us. RCM examinations are a great way to evaluate your learning progress. These workshops introduce the basics of music to dancers, performers, actors, artists and the general public. Syncretic Art workshops introduce people of all ages to the fusion of visual art, music, theatre and dance. • respond to colour, shape & texture through sound & movement. • express sound & choreographic ideas using line, shape & colour. • integrate sound, movement, visual art, music, theatre, dance & performance. I have conducted many Business in the Arts workshops at The Art Centre -Central Technical School. This workshop, for all instrumentalists, vocalists and performers, is an informal gathering once a month, by appointment, at my studio. The events are well attended and participants learn a great deal from each other. • share your love of the arts with others. From ancient and powerful to fun and contemporary masks fire up the imagination and unlock the inner eye. Masks may conceal and protect, reveal and enlighten, delight and enchant, amuse or frighten. • tap into the ancient & powerful through fun, contemporary mask & performance. • explore your relationship to the world around you. • create unique, comfortable, durable masks designed for active use in performance. Together we unleash the imagination, explore creative movement, dance, music, sound and theatre and bring the mask to life. Presentations, artist talks and demonstrations are available upon request. Please check the news page for upcoming events.